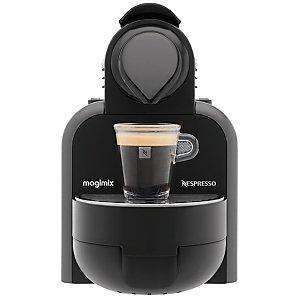 The Magimix M100 Nespresso coffee maker uses Nespresso coffee capsules for great tasting, hassle-free espresso. Included with the M100 is the Aeroccino, a cordless, nonstick, stainless steel jug, which quickly heats or froths milk, to the ideal temperature for your cappuccino or latte. It’s also supplied with whisk and stirrer attachments. The M100 has a 19 bar high pressure pump and thermoblock heating element for the optimum water temperature and pressure for great tasting espresso. It uses Nespresso coffee capsules, which are easy to load. Free delivery, and 3 year guarantee as standard. The Aerocinno really is a great little gadget. I had a Nespresso before moving to a bean to cup machine and the choice of coffees is fantastic. I still miss mine! Great offer, I have the older version and can't fault it. Nespresso membership is amazing too, gave us an extra 2 years warranty collect and return and a descaling kit for free just for registering a couple of years back. is there any frother for this machine? It comes with the Aeroccino milk heater/frother ! Is this a good machine for a latte? Is it easy to make and keep clean? Apprechite any info from people that have the unit already. You'd be better off refilling used nespresso capsules. But you can't beat the original - each one as fresh as the day it was packed. The best coffee IMO. How much are the capsules? Tried to look at the link but it looks like I have to register. How much are the capsules? Tried to look at the link but it looks like I … How much are the capsules? Tried to look at the link but it looks like I have to register. Eligibility – This promotion applies to purchases of Nespresso machines made at participating John Lewis stores only and is subject to availability. Who says the offer applies to online orders? For lattes its a bit of manual work unlike the large automated ones they offer, but you set the Aeroccino going with some milk then do your coffee shot on the machine and mix them together in another glass. The Aeroccino is quite easy to clean and the machine itself has the usual drip tray and also a tray to catch the dead capsules that you use. Such a shame it does not use Fairtrade Coffee. I would be very tempted with this price. tempted, would like to use coffeeduck but like the other variants of alternative pod it really boils down to the fineness of the grind of coffee as to whether its a success, if using beans this means another purchase of a decent grinder. Such a shame it does not use Fairtrade Coffee. I would be very tempted … Such a shame it does not use Fairtrade Coffee. I would be very tempted with this price. You can use your own coffee if you buy one of the refillable CoffeeDuck capsules. For lattes its a bit of manual work unlike the large automated ones they … For lattes its a bit of manual work unlike the large automated ones they offer, but you set the Aeroccino going with some milk then do your coffee shot on the machine and mix them together in another glass. The Aeroccino is quite easy to clean and the machine itself has the usual drip tray and also a tray to catch the dead capsules that you use. Mmm.. £99. Bought the M100 from Comet at Chirstmas for £60, so that makes the Aeroccino £39! but then I suppose you get the £40 of JL vouchers. As the unit can be picked up from Waitrose does anyone know if the voucher can be spent there...(to buy some pods). To be honest, i doubt you will be able to claim the £40 voucher. as it clearly said, it can be used with other promotions. And on John lewis website, any eligible products have a link to the voucher. This one doesn't . To be honest, i doubt you will be able to claim the £40 voucher. as it … To be honest, i doubt you will be able to claim the £40 voucher. as it clearly said, it can be used with other promotions. And on John lewis website, any eligible products have a link to the voucher. This one doesn't . It's just under the "Add to Basket" button, I've just looked at it and ordered. It does have a link, right hand side towards bottom of page. As the unit can be picked up from Waitrose does anyone know if the … As the unit can be picked up from Waitrose does anyone know if the voucher can be spent there...(to buy some pods). Yes the £40 voucher can be used in Waitrose stores, but they don't sell the pods either. They can only be purchased from club nespresso online or over the phone, or in one of their 4 UK boutiques. I thought I read about some compatible pods being made by other manufacturers, does anyone have any experience of these? You can't buy Nespresso pods in Supermarkets. Online mainly, although some Selfridges have Nespresso stores inside. I went to Lisbon this year & there were Nespresso shops every couple of streets. Wish it was like that here. Does this make normal black coffee (i.e. Americano) or just Espresso's ? Also how much do the pods cost? For those close to London you can also buy capsules instore in Harrods and Selfridges and there is no minimum quantity. They can also talk you through all the different capsules and give you samples. Does this make normal black coffee (i.e. Americano) or just Espresso's … Does this make normal black coffee (i.e. Americano) or just Espresso's ?Also how much do the pods cost? It can make a lungo, which is almost like an Americano. On Nespresso machines you can normally adjust the volume for a normal espresso shot (default 40ml) or a lungo shot (default 110ml). Pods cost 29p to 33p each - they have a selection of 16 blends that are called Grand Crus. You can buy them via Club Nespresso online or by phone. If you live close to a Nespresso boutique (There are only 4 in the UK, 2 of them in London), then you can also get them there. Not sure if you can get the £40 cashback. If you look at other Nespresso machines, such as the XN2003 (http://www.johnlewis.com/231079080/Product.aspx) the offer is mentioned next to the product description. For the M100 it just says special offer. harrods stotre is closed but they do have a Nespresso shop on Beachamp street next to Harrods and next month they are opening two new stores one in line with Harrods toward the V&A and another one off regent Street. I had one of this and used it for three years before my son took it to Uni and i bought a Delongi Nespresso machine... I love these machines and most of my freinds who have tried coffee at my place have ended up buying one... Great simple product that gives excellent coffee every time. And before anyone starts no i do not work for nor am i affliated to Nespresso in any way. Just love the product. For latte I don't find the aeroccino machine heats the milk up enough! The espresso is hot but the milk cools the lot right down to warm. Is the price for the pods in Selfridges the same as on their website? Is the Krups one better than this? so is this the auto machine or manual one i cant seem to work it out ? Is this product actually really good? I'm very tempted but when you see it at £129 elsewhere, and without the Aeroccino for £84 (houseoffraser.co.uk/Mag…ult,pd.html) I wonder if it's that great a price - but I suppose the £40 JL vouchers is what makes it a deal here. Edit: also just for info at House of Fraser, the Pixie is £98.